The Cotton Picker for Sale - Although the cotton stripper discussed above is a type of machine for harvesting cotton, its action is so different from the mechanical cotton picker from the mechanical cotton picker that the two types are discussed separately. The cotton picker performs the work of the hand picker in that only the locks of seed cotton are removed from the plant. Cotton picking units may be mounted on a tractor as a tractor attachment, or the machine may be built as a self-contained, self-propelled unit. There are single-row and two-row machines of both the tractor-mounted and the self-propelled types. The two-row self-propelled picker is the most popular type. 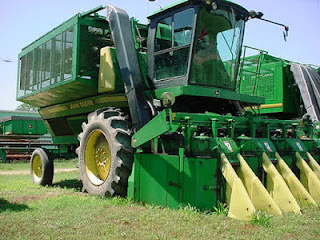 The self-propelled picker is a high drum picker, as it has 20 rows of spindles on a each drum. It is suitable for picking cotton from tall plants. The low drum machine has only 14 rows of spindles and is suitable for low-growing plants. There are two general types of spindles. The tapered-tooth spindles is equipped with three or four rows of machine-cut teeth designed to catch and hold the cotton fiber while the complete lock is wrapped around the spindle. These spindles are moistened, mainly to keep them free of gum, dirt, and int. The straight spindle may be only slightly roughened, or it may have of machine-cut teeth. Both types of spindles are moistened to aid the cotton fiber to adhere to the spindle so that the lock can be wrapped around the spindle as it is removed from the boll. One manufacture of mechanical cotton picker has recently redesigned their machine to travel 10 percent faster along the row or 5.5 km/h. the faster row speed made it necessary to increase the speed of the picker drum and the speed of the tapered barbed spindles. Throwaway doffer units are used. The features of the various units of a cotton picker have been discussed above. A better understanding of how a cotton picker works can be obtained if the flow of cotton is traced through the machine: (1) the plants are folded into the throat of the machine by rounded members, and low limbs and bolls are lifted up by limb-lifting fingers. (2) the revolving drum or belt or rotating spindles passes under moistening pads, and the spindles are thoroughly wetted. (3) the spindles then projected in among the limbs and bolls to engage the cotton. The plants are pressed against and around the spindles by spring –loaded pressure plates. (4) the spindles rotate and come in contact with the rotating rubber doffers or the stripper-bar doffers. (5) the cotton drops into the air or mechanical conveying system, which conveys the cotton to the basket. (6) air, drift, and trash are exhausted through grates which deflect the cotton into the basket. (7) hydraulic cylinders tilt the basket and dump the cotton into a trailer. 0 Response to "The Cotton Picker for Sale"